One reason we work hard throughout the week is to relax and have money to enjoy the weekend. What you don’t want to do is spend all your hard-earned cash on a single weekend. 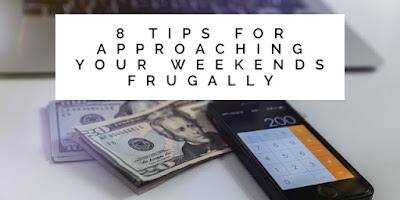 These tips can help you enjoy your weekends frugally. With anything in life, your odds of accomplishing goals will be significantly higher when you plan. Taking a few minutes to scout out the best deals on sites like Groupon. If you plan on only going to a restaurant only once over the weekend, choosing which meal will prevent the possibility of going out two or three times because you didn’t pack a lunch or go grocery shopping yet. You might wait until the weekend to go shopping because you don’t have the time after work. Instead of window shopping, be intentional about the items you want to purchase by making a shopping list. In other words, make a list according to a budget and stick to it! Only visiting stores and shopping for items on your list can keep you within budget. Sticking to your list will not only help you enjoy a frugal weekend, but it will also limit the amount of clutter in your house. After all, stores are constantly putting items on sale or clearance and it can be easy to buy items you don’t need if you don’t make a list. One budgeting tactic you can try out is creating a separate bank account that is used only for the weekends. Set the amount of money you want to spend each weekend or month by transferring that amount from your regular bank account. Once the money is spent, you stay home or look for free activities until your weekend account is replenished. If you don’t spend all the money this weekend, you can save it up to spend more on upcoming weekends. This can be a great way to save for a weekend getaway when you don’t want to pull from your savings. Choosing an account with its own debit card can also ensure you don’t accidentally use money from your primary bank account. It makes sense to use an online bank account which can be opened separately from your traditional bank. In general, most online bank accounts come with very low to zero fees, making them a feasible option as a secondary bank account. In addition to using a second bank account, keep your credit card out of the equation on the weekends. Unless you can immediately pay the balance with your second account, a credit card can encourage you to spend more than your weekend budget allows. Instead, pay with cash or a debit card, preferably from your weekend bank account. *The Weekends Count Family actually utilizes credit cards for almost every purchase. However, we use coupons and online deals for every single purchase we make. If you typically go to the bar or restaurant to watch a sports game or converse with your friends, invite them to your house instead. By having everybody bring a dish of food and beverages, you can save money on food and still watch the game or movie on TV. The atmosphere might not be as energetic, but you can still make the best of it. Even if you can afford to go out every weekend, you might decide to save money by only going out one night a week or only once or twice a month. Going to the club or a live concert can be fun, but it can also get expensive very quickly. 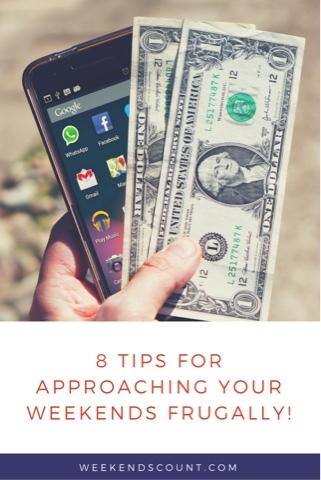 Reducing your nights out can be an easy way to curb your entertainment spending. You can use your free time to start new, frugal hobbies like Netflix binges, hosting game nights, or looking for free or cheap events to attend instead. If you live in a big city, you will be surprised at how many different activities are constantly going on. Depending on your hobbies, local parks often offer many of the same opportunities as private locations. Parks can be a free option to go hiking, have a picnic, and enjoy time outdoors. To attract visitors, some parks have also contracted with vendors to provide experiences like ziplining, boat rentals, and other activities like Frisbee golf courses. These alternatives can be cheaper than visiting an amusement park that offers similar experiences for more money. Some hobbies like golf, going to the movies, or attending a theater show can get expensive in a hurry. Instead look for cheaper hobbies like Frisbee golf instead real golf or visiting an amateur theater production instead of the traveling production. You can still participate in your existing hobbies, but you might consider reducing the frequency to save money. Having a frugal weekend doesn’t mean you can’t have fun. It just means you use your money more efficiently so you can still accomplish your other money goals. Doing so means you don’t have to stress about money on the weekends or work extra hard during the week just to afford your weekend plans. Josh recently got into the personal finance game when he decided to start up Family Faith Finance. His goal is to introduce a unique perspective while offering solid, unbiased advice. Thanks for the guest post Josh!